As I like to do from time to time on this blog, I would like to share with you the current status of my Trading Portfolio. I last wrote up my "trading portfolio update" on June 7, 2007, a month ago. There have been a few changes since then. But the biggest development has been my partipation in Covestor. You now can check my Covestor page and see the daily changes, all trades, and my performance relative to the indices and other registered investors. Thus far, I have been doing quite well as it has been a fortunate month for me especially with he Ventana bid by Roche. I am always grateful when my portfolio and my investing strategy is woking; but I am aware that there will be times when nothing seems to work. Sometimes the most successful approach is about persistence and patience. This past month also found me shaken-out of Gildan Activewear, which seemed to almost know I had sold on a dip and gleefully turned around to move higher making the top % gainers list that same day! O.K. that's a bit too anthropomorphic, but still, don't you just hate those days sometimes :). So I am back to 19 positions. Let's take a look at them and I will share with you in order: the symbol, number of shares, date of purchase, price of purchase, latest price (7/6/07), and percentage gain (or loss). Baldor Electric Co. (BEZ), 140 shares, 5/22/07, $47.19, $50.04, 6.04%. Since my last review on June 7, 2007, I sold 23 shares of Ventana at $76.83, and the rest of the 139 shares of Ventana (VMSI) at $76.502 later the same day on 6/26/07. On that day I purchased 350 shares of MEDTOX at $28.5534, Bolt hit another appreciation target and I sold 1/7th of my holding (21 shares) at $50.52. Finally, on 7/5/07, I sold my 210 shares of Gildan at $33.1101 when it hit an (8)% loss after purchase. Currently I am at 19 positions. My equity value is $119,962.09, my margin balance is at $56,031.51, giving me a 53.29% margin equity percentage. The account has a net value of $63,930.58. As of 7/6/07, I have $33,571.01 in unrealized gains in my account, and with the above trades have taken $3,100.15 in net short-term gains, and $17,824.18 in net long-term gains for a total of $20,924.33 in realized gains for 2007. I also have paid $2,563.07 in margin interest and have received a total of $272.58 in ordinary dividends and distributions and miscellaneous income. Please let me know if you have any comments or questions regarding my Trading Account. Please feel free to leave them on the blog or email me at bobsadviceforstocks@lycos.com. If you get a chance, be sure and visit my Stock Picks Bob's Advice Covestor page, where you can see a third-party analysis of my holdings and performance. Bradley Pharmaceuticals (BDY) "Long-Term Review #7"
As I write entry after entry on this blog, sometimes I feel like my early entries have gotten buried under the pile of posts. I do a 'weekend review' of stocks from a year or so ago, but what about the very early posts? Whatever happened to them? Or I hope you are asking that question. I started this blog back on May 12, 2003. Now, into my fifth year of blogging, I have 1,533 posts on this website. Even I have problems finding entries. One day I will have to develop a better search engine and index for my blog. Meanwhile, if you ever want to find a post, just use Google (I do!). Simply enter "Stock Picks Bob's Advice" along with the Stock name you are searching for. That usually works. Anyhow, sometime back I decided to dig back into the early entries and find out how things have worked out for the companies years later. I have been trying to do this on weekends as a "Long-Term Review", but one thing always leads to another, and now I am only up to my entry #7 Brady Pharmaceuticals which I first posted on Stock Picks on May 19, 2003. My last long-term review was for Genentech (DNA) which I had originally posted also on May 19, 2003, and re-reviewed on April 14, 2007. As the market nears its close, with the Dow down about 170 points, it seems a strange time to pick stocks with positive momentum. But only the strongest are able to buck the tide. Bradley Pharmaceuticals (BDY)as I write is trading at $15.77 up $1.02 or 6.92% on the day. This past quarter was reported on April 30, 2003, for the quarter ending March 31, 2003, sales totaled $14.9 million and increase of 60% over 2002. Net income was $1.2 million or an increase of 67% year over year....very nice numbers! Looking for the 5 year numbers on Morningstar we find revenue of $16 million in 1998, $19 million in 1999, $19 million in 2000, $26 million in 2001, and $40 million in 2002. Extrapolating current sales would give us a $60 million rate for 2003 (!). Prior to this recent quarter of a 60% sales increase, the prior four quarters in sequence showed a 75.90% (3/020, 57.93% (6/02), 48.84% (9/02), and 41.6% increase in sales (12/02). P.S. I do not own any shares nor do any of my family members own shares in this company." Let's take a closer look at Bradley and see how things turned out! First of all, Bradley (BDY) closed at $21.52 on July 6, 2007, for a gain of $5.75 or 36.5% since posting. I do not own any shares nor do I own any options on this stock. 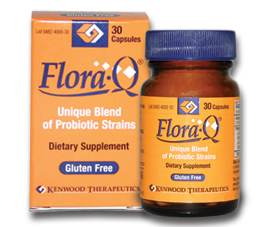 "...engages in acquiring, developing, and marketing prescription and over-the-counter products. It offers various dermatologic and podiatric products, including ADOXA and ZODERM for acne; ROSULA AQUEOUS for rosacea and acne; ROSULA NS PADS for antibacterial treatment; KEROL REDI-CLOTHS and KERALAC for mild to severe dry skin; and KERALAC GEL and KERALAC NAILSTIK for mild to severe dry skin and nail disorders. The company also offers CARMOL for mild to severe dry skin, xerosis, nail disorders, and inflammatory skin conditions; VEREGEN for external genital or perianal warts; SOLARAZE for actinic keratoses and pre-cancerous skin lesions; LIDAMANTLE HC for topical anesthetic and anti-inflammatory; ACIDMANTLE, a cosmetic skin pH balancer; ZONALON for topical anesthetic; SELSEB and CARMOL SCALP LOTION for dandruff; and AFIRM and BETA-LIFT for office procedure for chemical peels." On May 10, 2007, Bradley reported 1st quarter 2007 results. Net sales for the quarter ended March 31, 2007, came in at $37.8 million, up $3.0 million or 9% over the prior year same perid. Net income for the quarter was $2.5 million or $.15/diluted share, up strongly from $.01/diluted share the prior year. Even though this was a relatively strong quarter, the company disappointed analysts who had estimated that earnings would come in at $.24/share. More recently, the company stock has been doing better after an investment group led by the CEO, Daniel Glassman, made a bit to take the company private. Here is a review of that development by Motley Fool. Reviewing the Morningstar.com "5-Yr Restated" financials on BDY, we can see that revenue growth has been steady with $40 million in revenue in 2002, increasing to $133 million in 2005 and $145 million in 2006. Earnings have been erratic, increasing from $.67/share in 2002 to $1.35/share in 2003. Since then they dropped to $.49/share in 2004, stayed at $.49/share in 2005, and increased to $.58/share in 2006. The company has meanwhile increased outstanding shares from 10 million in 2002 to 16 million in 2006 and 17 million in the TTM. Free cash flow has been nicely positive and improving with $16 million in 2004 increasing to $29 million in 2006. The balance sheet is adequate with $46.7 million in cash and $41.7 million in other current assets. This total of $88.4 million in total current assets, when divided by the current liabilities of $69.5 million yields a current ratio of 1.27. Generally, from my perspective, current ratios of 1.25 or higher are nominally healthy. Reviewing the Yahoo "Key Statistics" on Bradley reveals this company to be a small cap stock with a market capitalization of only $363.1 million. The trailing p/e is moderate at 29.85 with a forward p/e (fye 31-Dec-08) estimated at 19.74. The PEG is also a bit rich at 1.79. Reviewing the Fidelity.com eresearch website on BDY, we find that the Price/Sales (TTM) ratio shows a reasonable valuation for Bradley coming in at 2.41 with an industry average of 7.07. However, the company is less profitable than average as evaluated by the Return on Equity (TTM), Bradley is reported at 6.45% compared to an industry average of 26.93%. Finishing up with Yahoo we can see that the company has 16.87 million shares outstanding with 13.08 million that float. Currently, as of 6/12/07, there were 2.28 million shares out short representing 4.5 trading days of average volume (the short ratio). This is 15.10% of the float and is a bit significant from my perspective as it is above the '3 day rule' that I have arbitrarily been using for significance of short interest. No dividends are paid per Yahoo, and no stock split is reported. 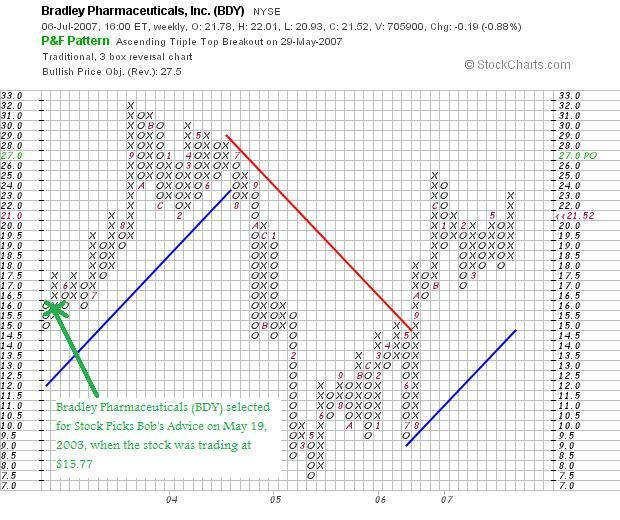 Looking at the "Point & Figure" chart on Bradley Pharmaceuticals from StockCharts.com, we can see that the stock peaked shortly after my "pick", climbing from the $15 level in May, 2003, to a high of $32 before dipping sharply back to a low of $8.00 in May, 2005. Since then, the stock has been recovering nicely, currently at the $21.52 level. I have rated this stock a "HOLD" because of the weakness in earnings the past several years. The latest quarter did show significant improvement and is encouraging. Also, the potential buy-out by the CEO and his investor group also adds interest to this as a stock investment. However, even though revenue has been positive, earnings have disappointed. The company has also used issuance of stock which is also hampering earnings growth. Valuation-wise, the Price/Sales looks good, but the ROE is a bit weak and the PEG suggests that the price also is a bit rich in terms of future earnings growth as estimated. An interesting stock pick. A stock which I would have sold if I had purchased it back in 2003 because of the subsequent stock dip in price; but a stock which is ahead significantly from the original pick price. Thanks so much for stopping by and visiting! If you have any comments or questions, please feel free to leave them on the blog or email me at bobsadviceforstocks@lycos.com. Be sure and visit my Stock Picks Bob's Advice Podcast Website, where you can listen to me discuss some of the stocks I write about here on the blog. In addition, check out the Social Picks Website that tracks Stock Picks Bob's Advice and see what a third-party has to say about my performance the past six months! If you are interested, for the past month I have been followed by Covestor and you can visit the Stock Picks Bob's Advice Covestor Website and see how my actual holdings in my Trading Portfolio have been working out for me! Have a great weekend everyone! Thanks once again for visiting and sharing your thoughts and ideas with me! Hello Friends! Thanks so much for stopping by and visiting my blog, Stock Picks Bob's Advice! As always, please remember that I am an amater investor, so please remember to consult with your professional investment advisers prior to making any investment decisions based on information on this website. As one of the things I like to do to share with all of my readers what I am thinking about investments, I have chosen to share with all of you my actual trading portfolio and my actual trades. On weekends, I have been trying to go through each of my now 19 positions, and update you as I once again review some of the basic fundamental information about each of these stocks. On June 17, 2007, I wrote up my holding Ventana Medical Systems (VMSI), which I recently sold after a 25 point rise after Roche announced a bid for the stock. Going alphabetically, I am now back to the bottom of my list with Wolverine World Wide (WWW). WWW is an old favorite of mine. I first wrote up Wolverine when the stock was trading at $28.90 (or actually $19.27 when adjusted for a 3:2 stock split February 2, 2005) on October 6, 2004. I "revisited" Wolverine on April 19, 2006, when the stock was trading at $23.91. Currently, I own 200 shares of Wolverine World Wide (WWW) in my trading account that have a basis of $23.55, purchased on 4/19/06. WWW closed at $28.51 on July 6, 2007, for an unrealized gain of $4.96 or 21.1% on these shares. On January 31, 2007, I sold 40 shares of my 240 original shares (1/6th of the holding) at $30.57 for a gain of $7.02 or 29.8%. I am now trying to sell 1/7th of my holdings at appreciation targets, not 1/6th as I did with Wolverine, and would plan on the upside of selling 1/7th of my 200 shares or 28 shares if the stock should reach a 60% gain or 1.6 x $23.55 = $37.68. On the downside, after a single sale at a 30% gain, my sale point would be at break-even or $23.55. Let's take another brief look at WWW and see if it deserves a spot on the blog! On April 18, 2007, Wolverine World Wide (WWW) announced 1st quarter 2007 results. Revenue totalled $281.1 million, up 6.9% over last year's first quarter revenue of $262.8 million. First quarter earnings per share climbed 14.7% to $.39/share, up from $.34/share. Net earnings were $22.3 million, up from $19.6 million last year. In light of the solid quarter, the upping of guidance at that time, the strong price chart, the impressive Morningstar.com "5-Yr restated" financials which show steady revenue, earnings, and dividend growth. Stable outstanding shares. Solid free cash flow, and a solid balance sheet. As one of the weekend "tasks" of this website, I like to look back on stock picks from the past. Starting about a year out, I have missed enough weekends of review that I am now 1 1/2 years out on reviews. On June 17, 2007, I reviewed stock picks from the week of January 16, 2006. Moving ahead a week, let's take a look at the picks from the week of January 23, 2006! As I have frequently pointed out, these reviews assume a 'buy and hold strategy' of investing, where equal dollar amounts of each stock are purchased and held regardless of subsequent price action. In practice, I advocate and employ a very different strategy that sells stocks quickly on small losses and slowly as the stocks appreciate. However, for the ease of this review, this analysis assumes a simpler buy and hold approach to all of these stock picks. The difference in this approach would certainly affect the outcome of the performance. Enough of the introduction! Let's take a look at the four stocks that were "picked" on the blog during the week of January 23, 2006. Please note that all charts are posted from StockCharts.com. On January 25, 2006, I picked Trimble Navigation (TRMB) for Stock Picks Bob's Advice when the stock was trading at $41.76. On February 23, 2007, Trimble had a 2:1 stock split making my effective pick price actually $20.88. TRMB closed at $32.50 on July 6, 2007, for a gain of $11.62 or 55.7% since posting. On May 3, 200, Trimble reported 1st quarter results. Revenue for he quarter increased 27% to $285.7 million from $225.9 million in the first quarter of 2006. Net income came in at $28.7 million, up 11% over net income of $25.8 million in the same quarter in 2006. Earnings per share came in at $.24/diluted share, up from $.22/diluted share during the 1st quarter of 2006. 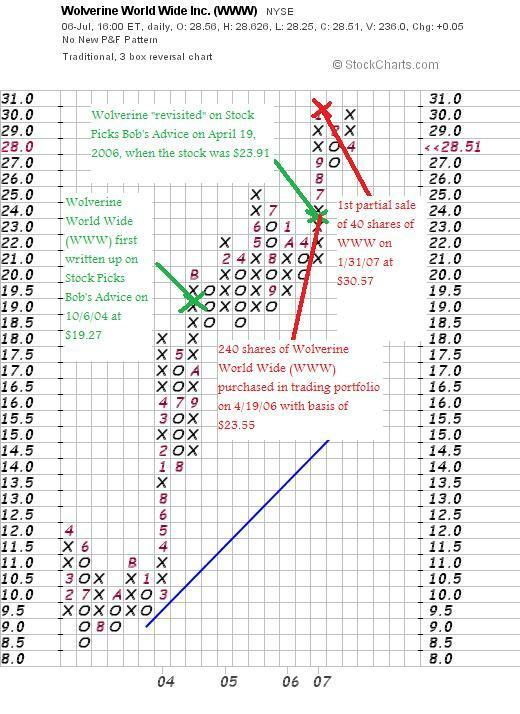 On January 26, 2006, I posted Headwaters (HW) on Stock Picks Bob's Advice when the stock was trading at $35.00. 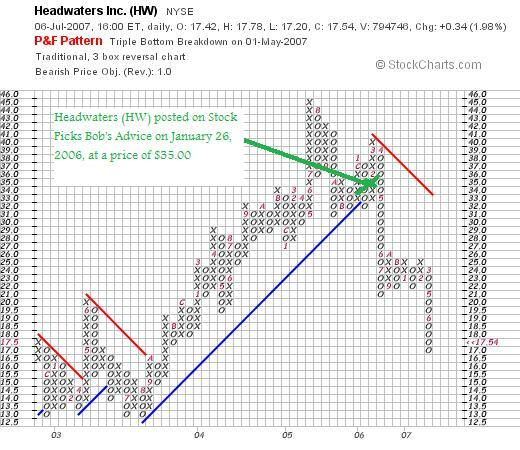 Headwaters closed at $17.54 on July 6, 2007, for a loss of $17.46 or (49.9)% since posting. On May 1, 2007, Headwaters (HW) announced 2nd quarter 2007 results. Revenue increased 2% to $274.1 million from $269.7 million in the same quarter in 2006. Net income came in at $27.2 million or $.59/diluted share, up 48% from the March 2006 quarter results of $18.4 million or $.40/diluted share. 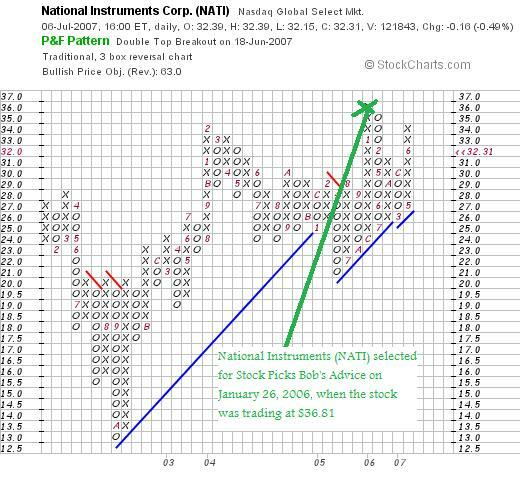 On January 26, 2006, I posted National Instruments (NATI) on Stock Picks Bob's Advice when the stock was trading at $36.81/share. NATI closed at $32.31 on July 6, 2007, for a loss of $(4.50) or (12.2)% since posting. On April 26, 2007, National Instruments (NATI) reported 1st quarter 2007 results. Revenue for the quarter came in at $172 million, up 11% over the prior year same quarter. Net income (GAAP) came in at $19 million, up 51% from prior year's $12.6 million result. On a per share basis this was $.23/diluted share, up from $.15/diluted share the prior year. 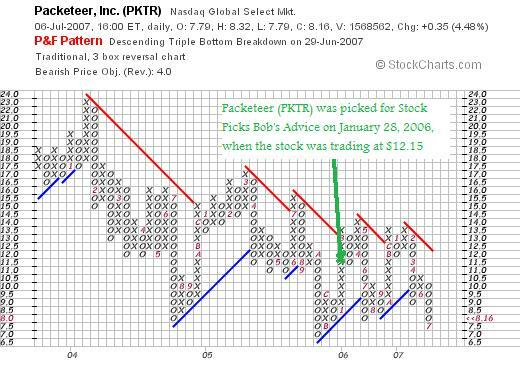 On January 28, 2006, I posted Packeteer (PKTR) on Stock Picks Bob's Advice when the stock was trading at $12.15. Packeteer closed at $8.16 on July 6, 2007, for a loss of $(3.99) or (32.8)%. On April 19, 2007, Packeteer (PKTR) announced 1st quarter 2007 results. Revenues came in at $34.7 million, up 7% from the $32.3 million reported in the first quarter of 2006. However, net revenues declined sequentially from the $42.7 million reported in the 4th quarter of 2006. The company reported a net loss of $(6.1) million or $(.17)/diluted share, down from a net gain of $4.5 million or $.13/diluted share in the prior year same period. So how did I do with these four stocks from about 18 months ago? In a word, mediocre. The four stocks had an average loss of (9.8)%. This once again has a few important take-home lessons. First of all, the Packeteer chart looked awful even when I posted it. I even made note of the weak chart in the post. What was I thinking? Above all, this shows the importance of limiting losses so that small losses don't become huge and that small gains are allowed to run as much as possible. Anyhow, thanks again for stopping by and visiting! If you have any comments or questions, please feel free to leave them on the blog or email me at bobsadviceforstocks@lycos.com. I have a few reminders for you as well! Remember to visit my Stock Picks Bob's Advice Podcast Website, where you can listen to me discuss some of the many stocks I write about here on the blog. To review the performance of my stock picks since January 22, 2007, (my blog goes back to 2003 but I signed up with Social Picks this year), you can visit my Social Picks Stock Picks Bob's Advice Website. More exciting, in my opinion, is the possibility to follow my actual trading portfolio on Covestor where you can visit my Stock Picks Bob's Advice Covestor Page. This site monitors my actual holdings, my actual trades, and my actual performance. It will be interesting to let you know how I am doing with actual third-party evaluation numbers. Thanks again for dropping by! Remember that I am truly an amateur so check with your professional advisers, please. Have a great weekend and a great week trading next week! Wipro (WIT) "Revisiting a Stock Pick"
It is Friday and we have all made it through another week! I haven't been writing up too many new ideas on the blog and I wanted to take a moment to write up a name that I have visited in the past, Wipro (WIT). I do not own any shares of Wipro directly, but my stock club does own some shares of this company. I was looking through the list of top % gainers on the NYSE this evening and noticed that Wipro Ltd (WIT) had made the list closing at $16.08, up $.78 or 5.10% on the day. I first reviewed Wipro on Stock Picks Bob's Advice on October 4, 2004, almost three years ago (!) when the stock was trading at $20.86. WIT split 2:1 on September 2, 2005, making my effective pick price actually $10.43. With the stock closing at $16.08, this represents a gain of $5.65 or 54.2% since my original post. "...together with its subsidiaries, provides information technology (IT) services and products, including business process outsourcing services (BPO) worldwide. The company operates in three segments: Global IT Services and Products, India and Asia Pac IT Services and Products, and Consumer Care and Lighting. The Global IT Services and Products segment offers IT consulting, custom application design, development, re-engineering and maintenance, systems integration, package implementation, technology infrastructure outsourcing, and research and development services in the areas of hardware and software design. It also provides BPO services, which include customer interaction services, finance and accounting services, and process improvement services for repetitive processes." This company is an India-based technology outsourcing firm. How did they do in the latest quarter reported? On April 19, 2007, Wipro reported 4th quarter 2007 results. For the quarter ended March 31, 2007, total revenue was Rs (rupees) 149.43 billion ($3.47 billion), a 41% over the same period last year. Net income was Rs 29.17 ($677 million) a 44% increase over the same quarter the prior year. These results beat analysts expectations. Looking at the Morningstar.com "5-Yr Restated" financials on WIT, we can see that the company has been steadily, and strongly growing its revenue from $702 million in 2002 to $2.4 billion in 2006. Earnings which were $.13/share in 2002, stayed flat at $13 in 2003, then steadily increased to $.32/share in 2006. The total shares has been essentially stable with 1.39 billion reported in 2002, increasing to 1.41 billion in 2006 and 1.43 billion in the trailing twelve months. Free cash flow has been positive and growing with $145 million reported in 2004, $276 million in 2005, and $287 million in 2006. The balance sheet appears solid with $878.2 million in cash, which by itself can cover both the $473 million in current liabilities and the negligible $11.7 million in long-term debt, and still leave almost $400 million in cash available! Calculating the current ratio, we find Wipro with a total of $1,609.4 million in total current assets, which, when compared to the $473 million in current liabilities yields a current ratio of 3.4. Looking at Yahoo "Key Statistics" on Wipro, we can see that this is a large cap stock with a market capitalization of $23.46 billion. The trailing p/e is a moderate 32.16 with a forward p/e (fye 31-Mar-09) estimated at 23.30. The PEG comes in at a very reasonable 1.00. The price/sales is a bit rich at 6.04 but I don't have any industry comparisons to truly value this number. In terms of profitability, according to the Fidelity.com eresearch website, the company does well relative to similar companies with a Return on Equity (TTM) of 34.39% compared to the industry average of 28.42%. Finishing up with yahoo, we can see that there are 1.46 billion shares outstanding with only 270.6 million that float. As of 4/10/07, there were 2.74 million shares out short representing 7.5 trading days of volume. The company currently pays a forward dividend of $.12/share yielding 0.85. The last stock split was, as noted, a 2:1 split on 9/2/05. Let's take a look at the "point & figure" chart on Wipro from StockCharts.com. We can see that after an initial decline from $7.00 in March, 2002, to a low of $3.00 in May, 2003, the company has been moving in a 'saw-tooth' pattern steadily higher to a level of $18 in February, 2007. The stock, at $16.08, is technically still moving higher with no evidence of a breakdown in the price appreciation pattern. Avoiding any political implications of outsourcing (avoiding politics is always difficult for me! ), this has been a great stock pick for me as the firm continues to show strong revenue and earnings growth along with price appreciation! Reviewing a few of the pieces of information reviewed, the stock was moving sharply higher today, the latest quarter beat expectations with strong revenue and earnings growth. The company has been growing steadily the last 4 years with rather rapid increases in both revenue and earnings while still keeping a fairly steady hand on the outstanding shares. Free cash flow is positive and growing. And the balance sheet is solid. There really is little not to like about the company. Thanks again for visiting my blog! I hope that you all have a nice weekend and if you have any comments or questions, please feel free to leave them on the blog or email me at bobsadviceforstocks@lycos.com. I hope that all of you had a great time on the 4th. 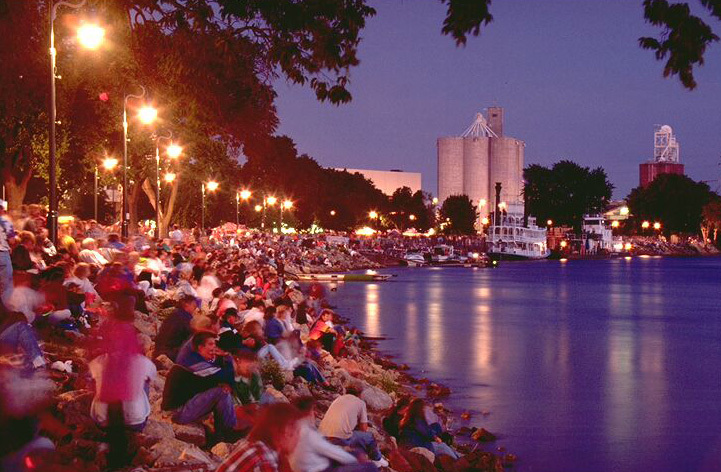 I was down at the Riverfest but didn't catch the fireworks as this photo shows. But this isn't about partying. This is about trading and managing a portfolio! So let me get down to business. Unfortunately, Gildan Activewear (GIL), a great company, and a strongly performing stock, hit an 8% loss in my portfolio. If I were to review the purchase, I would note that the chart looks a bit overextended. So this isn't a pan on the investment, it is a reflection of bad luck in entering a stock at the wrong time. But I shall be sticking to my rules now and in the future as much as possible. And I sold my Gildan Shares. So why did I rate the stock a 'hold' instead of a sell. Because the story appears to be intact, and I am selling my holding based on the performance within my portfolio, not because I dislike the company. Anyhow, I sold my 210 shares at $33.11. These shares were purchased on 5/21/07 for $36.13. So this was a loss of $(3.02) or (8.4)% since my purchase. Since this sale is on "bad news", even though I am now down to 19 positions, I do not have a "permission slip" to add a new position. I shall be waiting for a sale on "good news" which is a sale at an appreciation target, as a signal to add a new holding. As you may recall, I sell my shares at 8% loss after an initial purchase, at break-even if I have sold once at a 30% targeted appreciation point, or at 50% of the highest appreciation sale percentage if I have sold more than once with gains. Thanks so much for stopping by and visiting! Please feel free to leave a comment on the blog or email me at bobsadviceforstocks@lycos.com with any of your comments or questions. A few moments ago Bolt (BTJ) hit one of my appreciation targets. I had 150 shares in my trading account, and with the stock passing the 180% appreciation level, I sold 1/7th or 21 shares of Bolt at $50.52. These shares had been purchased 1/12/07 (!) at a cost basis of $17.44 (!). Thus, I had an appreciation of $33.08 or 189.7% on these shares. As you probably know, I target my stocks for partial sales at 30, 60, 90, 120, then 180, 240, 300, 360, 450%, etc., appreciation levels. Currently, I am selling 1/7th of my holding when shares reach these points. 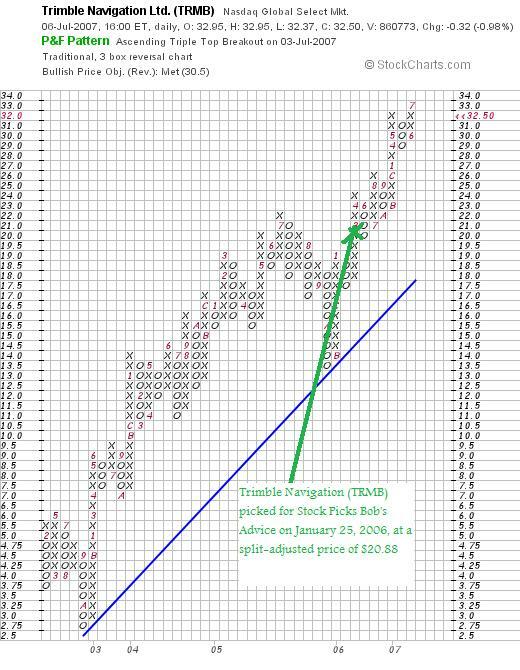 With this in mind, my next targeted sale on the upside would be at a 240% appreciation level or 3.40 x $17.44 = $59.30. On the downside, I have been trying to sell stocks either on some fundamental bad news or if they should decline to 50% of the highest appreciation level at which there was a sale. This way, I am continually pushing up the stops as the stock appreciates. With Bolt having now been sold at the 180% appreciation level, on the downside, I plan on selling all remaining shares if the stock should decline to a 90% appreciation above my purchase price or 1.9 x $17.44 = $33.14. Thus, I give the highly performing stocks in my portfolio more 'room to play' so to speak :). Anyhow, it is nice to report good news once again! The market is kind to me and I have been starting to pay down my darn margin which is far higher than I would prefer. Currently I am at 20 positions in my account which is my new 'maximum' size for the portfolio. If I were below 20, this sale would be giving me a "permission slip" to add a new holding. At the maximum, I use sales like this to either accumulate cash or in my case pay down margin! Thanks again for visiting! If you have any comments or questions, please feel free to leave them on the blog or email me at bobsadviceforstocks@lycos.com. If you get a chance be sure and visit my Stock Picks Podcast Site. Also, take a look at my Social Picks account, where Social Picks evaluates my stock selections from the time I started with them which was a bit more than six months ago. Also, check out my Covestor account which tracks my actual trading portfolio and compares it to other investors and the indices! For those of you in the States, I wish you a very Happy 4th of July. As we celebrate our freedom, let's wish everyone all over the world the blessings of peace and freedom that we enjoy for ourselves here in America! Some Thoughts on Investing for a Saturday Afternoon! Instead of the usual discussion of specific stocks and answering specific questions about investing, I wanted to take a moment to share with you some of my philosophy, some of the things I believe are important about investing and blogging. First of all a word about me. I am a physician, so I don't support myself by investing, I am not an advisor, I don't manage money for anyone, I don't have any newsletters or salesmen or letters to send you. I don't even really ask you for contributions. I write this blog because this is my passion, my hobby, and part of my life. I write that I am an amateur because I am an amateur. I hope and believe that I am becoming a good amateur, but that is up to you to judge. Honesty is part of my life. It is integral to my professional life and essential to this blog. I share with you my thinking and my opinions on stocks and my own trading portfolio. When I buy shares I let you know, when I sell shares I let you know, when I make money I let you know, and most importantly, when I lose money, I share with you as well. Because so many of you are my friends. I share these thoughts with all of you readers and hope that you realize that what I do or suggest might not be right for you. When I ask you to consult with advisers I really mean just that. What I do might not work for you. I am not positively sure that it will work for me. But thus far it has been working well. I am an investor. I buy shares for the long haul. But I am prepared to trade. I do this in as quiet as fashion as possible. This is not about screaming and hollering and phrenetic activity. I spend a lot of time observing the market and listening to my own portfolio. I am not trying to be smarter than the smartest investors. For I am not. But I am trying to observe which stocks are climbing and among those, which might have healthy characteristics which might support further price appreciation. But I make my share of mistakes. That is why I have a portfolio of stocks. Not because I am trying to diversify. Because I use the same strategy with each of my stocks. But because any particular stock investment may be a mistake. And I am prepared to part with any and all of them. I am not a buy and hold investor. But I hope to buy and hold many of my investments for a very long time. I have chosen to listen to my portfolio as I adjust my exposure to equities. When stocks sell on bad news, that is price declines, I do not fight the market. I 'sit on my hands' as I like to say, and wait for another signal. A signal to let me know that everything is o.k. and it is time to buy. I use my own portfolio for that signal as well. I wait for a stock to hit an appreciation target and sell a portion of that holding and then at that time, buy another stock. I do not think I can outguess the smartest minds in the market. But I am willing to give them credit. I will tell you that William O'Neil inspired my own thinking. I like to talk about Robert Lichello, and will mention Paul Sturm and others. They are my mentors. They may not even know I have them as mentors, but I know. And I appreciate the wisdom of others. When I pick a stock to buy I purchase it off the top % gainers lists. They have already been discovered by someone else. I do not try to discover things that others haven't noticed. And I manage my holdings carefully. I sell my poorly performing stocks quickly and completely, and my appreciating stocks slowly and partially. This bias results in a portfolio of strong, performing stocks. I demand the most of my holdings. Will all of this work? I don't know. I am not even sure why I do all of this or why I write. I love to share with all of you my ideas, my trades, my perspective on stocks. I hope you all enjoy my effort. Where this takes me I still am not sure. I hope that all of this is successful for me and if any of you have adopted some of my techniques in a successful fashion, please drop me a line or leave a comment and let me know how it is working out. Your friendship is greatly appreciated. A Reader Writes: "How often do you get sucker punched with your method?" Earlier today I received another great inquiry from Doug S., a regular reader and contributor of questions to this website. about 88) about 95% of the time(news item on a rare occasion). 15% of the time and probably another 10% where the following action is generally disappointing. PS: disclosure: Purchased 800 NATH day just after my last e-mail. Trading more liquid than i thought." Thanks so much for writing Doug! Your idea about "trigger points" to initiate a position or purchase of shares isn't too far from my own approach. While you may be scanning the news for these earnings releases, I am scanning the lists of top % gainers for stocks on the move. Often, if you review some of my past posts, the reason a stock makes a big move is exactly because of an earnings release that is viewed favorably by 'the street'. I am not sure how often I get "sucker punched" as you write. I will tell you that if you go back about a month to my prior experience with MedTox (MTOX) you will see that I owned shares for a very short period of time, just a few days as I recall, until the stock declined to a sell point. I guess that is what you would call getting sucker punched :). In fact, every single one of my trades is on the blog for the past four years. I cannot give you the exact entries, but if you scan through the blog you will find them under the heading of "trading transparency". I do not know the exact % of these that I have had that have ended up in rather rapid sales. I suspect they are 10% or less of my purchases, but that is, of course, just a guess. Since I am doing my homework, examining more than a price move but the Morningstar.com report, the latest quarter, and some valuation numbers, I believe that sharp moves higher are often followed by further appreciation of the stock due to all of the other factors contributing to the attractiveness of that investment. At least that is what I am hoping for! Wish me luck and keep me posted and keep on writing. p.s. I haven't looked at NATH, and do not own any shares of NATH nor do I have any shares of CLB. I was looking through the list of top % gainers on the NYSE this evening and came across Core Laboratories (CLB) which closed at $98.62, up $7.53 on the day or 8.27%. I do not own any shares nor do I have any options on this stock. "...provides reservoir description, production enhancement, and management services to the oil and gas industry worldwide. It engages in determining quality and measuring quantity of the fluids, such as natural gas, crude oil, and water and their derived products in the oil and gas fields." How did the company do in the latest reported quarter? On April 23, 2007, CLB reported 1st quarter 2007 results. Revenue for the quarter ended March 31, 2007, increased to $155.7 million, up 13% from $137.3 million in the same quarter in 2006. Earnings came in at $1.04/diluted share, up 79% from the year-earli results and also increased 6% sequentially from the 4th quarter of 2006. Net income climed 56% to $25.3 million from $16.1 million last year. The company also raised guidance for the full year in the same report. In that report two months ago they guided to earnings of $4.30 to $4.50, and revenue in the $650 to $670 million range. Yesterday, after the close of trading the company raised guidance further with 2nd quarter 2007 results expected now to come in between $1.15 and $1.17, ahead of prior guidance of $1.05 to $1.10. This would represent about a 66% increase year-over-year in earnings. "Core's anticipated quarterly results are due to even stronger than expected performances from each of its three operating segments. There is strong demand for the Company's Reservoir Description services, especially in the Middle East region, where Core continues to expand operations. The Company's Canadian operations, which generated 13% of the Company's revenue in 2006, are expected to post a strong quarter." The company also raised full year 2007 guidace to revenue in the $660 million to $670 million range, up about 15% from the 2006 levels. 2007 earnings per share are now expected to come in at $4.50 to $4.70, an approximately 47% to 53% increase over 2006 results. The street liked what it heard yesterday and wasted no time bidding up the price of CLB today! Reviewing the Morningstar.com "5-Yr Restated" financials on Core Laboratories, we find that revenue has steadily grown from $331 million in 2002 to $576 million in 2006 and $594 million in the trailing twelve months (TTM). Earnings during this period were less consistent, with a loss of $(.27) in 2002, increasing to a profit of $.60/share in 2003, then dropping to $.43/share in 2004. However, since then earnings have shown strong growth with $3.07/share reported in 2006 and $3.53/share in the TTM. Free cash flow has been positive and growing with $43 million in 2004, $96 million in 2006 and $91 million in the TTM. The balance sheet is solid with $29 million in cash and $184.1 million in other current assets. This total of $213.1 million in total current assets, when compared to the $83.4 million in current liabilities yields a current ratio of 2.56. In addition, the company is reported to have $349 million in long-term liabilities and $275.2 million in long-term assets. Reviewing the Yahoo "Key Statistics" on Core Laboratories, we can see that this is a mid cap stock with a market capitalization of $2.36 billion. The trailing p/e is 27.97 with a forward p/e (fye 31-Dec-08) estimated at 17.58. Earnings growth is expected to continue strong as the PEG ratio is a very reasonable 0.83 (5 yr expected). According to the Fidelity.com eresearch website, the valuation is a bit rich with CLB having a Price/Sales ratio (TTM) of 3.74 compared to the industry average of 3.65. However, the company is also significantly more profitable than average with a Return on Equity (TTM) of 71.96%, compared to the industry average of 30.86% according to Fidelity. Finishing up with Yahoo, we can see that there are only 23.91 million shares outstanding with 18.70 million that float. As of 5/10/07, there were 1.3 million shares out short, representing 5.8% of the float or 4 days of trading volume (the short ratio). In excess of my own '3 day rule', this short interest may well contribute to the price rise on good news today! No dividend is reported on Yahoo, and the last stock split was a 2:1 split on December 22, 1997. If we review the StockCharts.com "point & figure" chart on Core Laboratories, we can see that the stock has exhibited a phenomenally strong chart since breaking out at the $12.50 level way back in July, 2003. The stock has moved almost vertical the past four years. 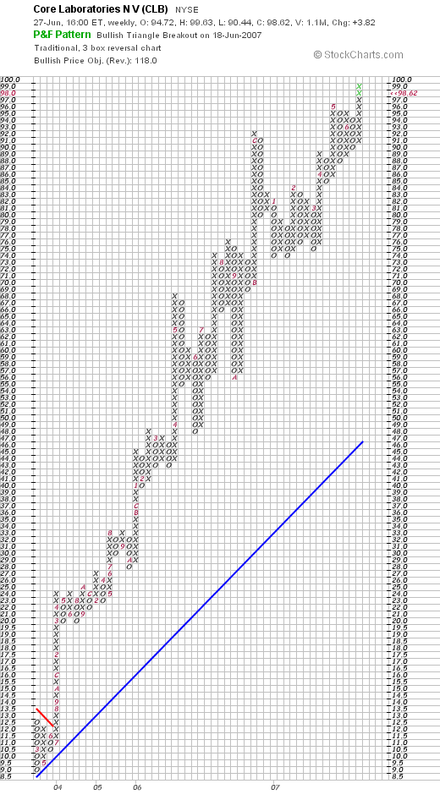 I see no evidence of weakness although there is plenty of evidence that the chart may be over-extended. Summary: What do I think about Core Laboratories N V (CLB)? As you might be able to tell I am practically infatuated with the company :). Seriously. This company reported a great quarter just a couple of months ago, raised guidance, and two months later, business is so strong they are raising guidance once again! Longer-term, the Morningstar.com report is very nice except for some earnings weakness a few years ago, the company has shown incredible strength in delivering growth in both earnings and revenue. They are solidly free cash flow positive, and have a solid balance sheet. Valuation-wise, the p/e is a bit rich but the forward p/e is in the teens and the PEG is under 1.0. Price/sales is average for the business but the Return on Equity is 'head and shoulders' ahead of its competition. There are even a bunch of short-sellers waiting to buy shares and the chart is unbelievable. Unless something bad is announced and I see no sign of that, the company appears to be moving full steam ahead! Anyhow, there's a new name for the blog and all of you readers. Thanks so much for visiting! Have a great day trading tomorrow!